For the International Mega Drive version, see Dr. Robotnik's Mean Bean Machine. For the International Master system and Game Gear versions, see Dr. Robotnik's Mean Bean Machine (8-bit). JP 2013-01-30 ¥286 (300) ? One frame of the Mega Drive version title screen (which has a different animation from the arcade version). Puyo Puyo (ぷよぷよ) is a Japanese falling block puzzle game developed and published by Compile in 1992 for Sega System C2 arcade hardware. It is widely considered to be the first "major" entry in the Puyo Puyo series, being a noticeably expanded port of a prior 1991 Puyo Puyo release for MSX2 computers and the Nintendo Famicom in Japan. Puyo Puyo is a spin-off of Compile's earlier Madou Monogatari series of RPGs, featuring the same cast of characters and a similar setting, but with wildly different gameplay. The Japanese arcade version does not elaborate on the game's story, but materials included in the home versions explain that protagonist Arle Nadja has learned the spell named "Owanimo" (a spell which causes four similarly-colored creatures to disappear) and is going on a journey to defeat Satan. The English arcade version features an entirely different story, along with new character names: Silvana (Arle Nadja) battles against the Dark Prince (Satan) and his Black Kingdom. Puyo Puyo is a "falling block" puzzle game similar in nature to Tetris, where the objective is to connect four or more "puyo" of the same colour to clear them from the playfield (known officially as "popping"). Players score points for the puyo that are popped, but lose if a tower of puyo reaches the top of the playfield (or specifically, a puyo blocks the tile third from the top left). Success relies on the player staying alive as long as possible, with the speed of play gradually increasing as time goes on. Unlike Tetris (or Columns), puyo in Puyo Puyo are effected by gravity after being placed in the field, so if an empty space exists below a puyo, it will fall to the tile below. This allows for "chains" or "combos", where multiple groups of puyo can be popped in one turn (and thus, more points are awarded). Chaining puyo in this way is typically the best way to achieve a high score. In its original MSX and Famicom forms, Puyo Puyo was strictly a single player experience where surviving was the only major goal. "Missions" were later added, encouraging players to pop all puyo from the screen in a given time limit, and a basic two-player mode was introduced, where the winner was simply the person who lasted the longest. This 1992 iteration of the game offers perhaps the most significant upgrade - competitive play, which is the major focus of both this game and most Puyo Puyo titles in the years ahead. When playing competitively, Puyo Puyo pits either two human players, or one human and AI against each other. Here, popping puyo not only has the advantage of freeing up space, but the act sends "ojama puyo" (お邪魔ぷよ) to the opposing player - puyo which cannot be linked together, and are only popped if next to a puyo about to be cleared. The more chains, the more ojama puyo is sent to the other player, inevitably causing them to lose. Later games would attempt to give a bit of personality to each type of puyo, however no such feature exists in this game. Initially players can move the couple left or right ( and by default in the Mega Drive version), rotate them clockwise ( or ) or anticlockwise ( ), or speed up their descent ( ) (this also adds some points to the score). As long as there is space to do so, falling pieces can be rotated clockwise or anticlockwise. Much like Tetris, the game gives players as bit of leeway, giving a fraction of a second for extra rotations should the piece be about to stop. In the event that there is an obstruction on the left or right, the piece is pushed one tile in the opposite direction. If there is an obstruction on both sides, the piece cannot rotate (something rectified in later games). Puyo are popped when four or more of the same colour are grouped together with horizontal or vertical connections. The tiles which they occupy are then made empty for any puyo above to fall into. Competitive mode also introduces the concept of ojama puyo, which can only be removed if adjecent puyo are popped. The Japanese arcade version received a software revision ("Rev. B"); this fixes a glitch that allows the player to prevent an AI opponent from manually dropping their Puyo by holding the second joystick to the left or right. However, the Mega Drive version is based on Rev. A, and thus the glitch can be recreated using a second controller. Additionally, the arcade game was translated into English, though its release date and region(s) are currently unknown. The English translation of the arcade game was eventually included in Sega Ages Puyo Puyo. 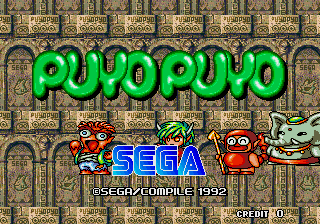 The arcade version of Puyo Puyo has been ported to various consoles, including the Sega Mega Drive and Sega Game Gear. The Game Gear version, when played in a non-Japanese system, becomes the English-language Puzlow Kids; this version's translation is nearly identical to that of the English arcade game. Aside from the arcade version, ports of this game that were released in North America and Europe were heavily-localized. Dr. Robotnik's Mean Bean Machine is one such version, releasing for the Genesis, Game Gear, and Sega Master System. As part of plans to commemorate the 20th anniversary of the series, in early 2011 Sega announced a Virtual Console rerelease of Puyo Puyo with online multiplayer support — the first Virtual Console game to be modified in such a way. Special Thanks to: All Our Fellows. Main article: Puyo Puyo/Magazine articles. Main article: Puyo Puyo/Promotional material. NEC Retro has more information related to Puyo Puyo.